Labtech offers a comprehensive choice of standard Micro to Nano SEM pin stubs to support virtually all applications. Standard SEM pin stubs are compatible with FEI, Philips, Tescan, Phenom, AmRay, Carl Zeiss, Cambridge Instruments, Leica, CamScan and Novascan SEMs. SEM pin stub with 6.4mm diameter top, standard size pin, made of aluminium. Packet of 100. SEM pin stub with 6.4mm diameter top, standard size pin, made of aluminium. Packet of 50. SEM pin stub with 5.9mm diameter top, standard size pin, made of aluminium. Packet of 10. SEM pin stub with 5.9mm diameter top, standard size pin, made of aluminium. Packet of 100. SEM pin stub with 5.9mm diameter top, standard size pin, made of aluminium. Packet of 50. SEM pin stub with 12.7mm diameter top, standard size pin, made of aluminium. Packet of 100. SEM pin stub with 12.7mm diameter top, standard size pin, made of aluminium. Packet of 50. 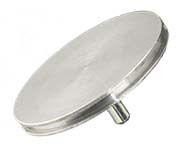 SEM pin stub with 19mm diameter top, standard size pin, made of aluminium. Packet of 10. SEM pin stub with 25.4mm diameter top, standard size pin, made of aluminium. Packet of 10. SEM pin stub with 25.4mm diameter top, standard size pin, made of aluminium. Packet of 100. SEM pin stub with 25.4mm diameter top, standard size pin, made of aluminium. Packet of 50. EM-Tec PS15 Pin stub swivel mount - Ø15x15mm- pin (each). The head of the mount is attached to the pin via a swivel hinge which allows for 90 degrees tilting each way. Excellent mount for SEMs without tilting facilities or when random tilt angled are needed. When the desired tilt angle is set, the top is secured with a socket cap screw. Top diameter is 15mm and height above pin is 15mm. 45 degree angled standard profile 12.7mm diameter standard SEM pin stub, made from aluminium. Packet of 1. 45 degree angled standard profile 12.7mm diameter standard SEM pin stub, made from aluminium. Packet of 10. 45 degree angled standard profile 12.7mm diameter standard SEM pin stub, made from aluminium. Packet of 5. 45/90 degree angled standard profile 12.7mm diameter standard SEM pin stub, made from aluminium. Packet of one. 45/90 degree angled standard profile 12.7mm diameter standard SEM pin stub, made from aluminium. Packet of 10. 45/90 degree angled standard profile 12.7mm diameter standard SEM pin stub, made from aluminium. Packet of 5. 45 degree angled standard profile 25.4mm diameter standard SEM pin stub, made from aluminium. Packet of one. 45 degree angled standard profile 25.4mm diameter standard SEM pin stub, made from aluminium. Packet of 5. 45/90 degree angled standard profile 25.4 mm diameter standard SEM pin stub, made from aluminium. Packet of one. 45/90 degree angled standard profile 25.4 mm diameter standard SEM pin stub, made from aluminium. Packet of 5. Double 45/90 degree angled standard profile 25.4 mm diameter standard SEM pin stub, made from aluminium. Packet of one. Double 45/90 degree angled standard profile 25.4 mm diameter standard SEM pin stub, made from aluminium. Packet of 5. Double 90 degree angled standard profile 25.4 mm diameter standard SEM pin stub, made from aluminium. Packet of one. Double 90 degree angled standard profile 25.4 mm diameter standard SEM pin stub, made from aluminium. Packet of 5. Engraved SEM pin stub, Ø12.7mm diameter with four numbered fields, made of aluminium. Packet of 1. Engraved SEM pin stub, Ø12.7 diameter with four numbered fields, made of aluminium. Packet of 10. Engraved SEM pin stub, 19mm diameter with four numbered fields, made of aluminium. Packet of 1). 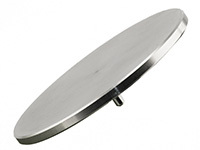 SEM dish-type pin stub, 12.7 x 7mm diameter with 1.5mm dish depth, made from aluminium. Packet of one. SEM dish-type pin stub, 12.7 x 7mm diameter with 1.5mm dish depth, made from aluminium. Packet of 10. SEM dish-type pin stub, 12.7 x 7mm diameter with 1.5mm dish depth, made from aluminium. Packet of 5.